“Last week during the thaw the creek opened up in spots, and I took advantage of it to go out for a dip on Friday,” C. H. Little wrote to his mother in January, 1935. Rev. Carroll Herman Little (1872-1958), a professor at the Evangelical Lutheran Seminary of Canada and Waterloo College, was known to swim in all seasons and temperatures, even when the Region’s creeks were not yet fully thawed. Students in Dr. Mary Chaktsiris’ DH300: Digital Editing and Publishing class learned first-hand about the life - quirks and all - of a man who taught from 1917 to 1947 and was considered a prominent figure on the Waterloo campus. The students transcribed almost 30 letters from Little to his mother written between 1932 and 1936 in the midst of the Great Depression. 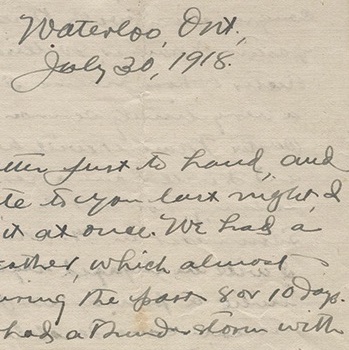 The Laurier Archives has now made these transcriptions, along with the digitized letters, available online. C.H. Little was a Lutheran pastor, teacher, and writer. He also served as president, bursar and dean of Waterloo College. While he was known by his contemporaries to espouse conservative theology “typical of the seventeenth century,” Little’s rigor and determination helped the seminary and college to survive the political and economic hardships of the 1910s and 1930s. In weekly letters to his mother, he reported on his growing family, commented on national and local politics, and described in detail the family’s efforts to put food on the table during the Great Depression. In the class, students worked together to decipher and annotate the handwritten letters. In the annotations, the students researched some of the unexplained references found in the correspondence. One annotation, for example, digs into the 1936 Moose River mine collapse in Nova Scotia. Another explains the once-ubiquitous Canadian synonym for sofa: Chesterfield. Find the transcriptions and annotations online. More information about the entire Carroll Herman Little Fonds, housed in the Laurier Archives, which also includes Little’s records, publications, sermons, and professional correspondence, can be found by visiting our website. Digitized versions and transcriptions of some of the letters in the collection, which range from 1891 until 1946, are available online.